US President Barack Obama has blasted the UK and France over their Libya policy in the aftermath of the 2011 overthrow of Libyan leader Muammar Gaddafi. In an interview interview with the Atlantic, Obama said he was wrong to believe the allies would be “invested in the follow-up” to Gaddafi’s ouster. “When I go back and I ask myself what went wrong, there’s room for criticism, because I had more faith in the Europeans, given Libya’s proximity, being invested in the follow-up” he said. He went on to state that the ‘mess’ was largely due to the inaction of British Prime Minister David Cameron, who was “distracted by a range of other things” at the time. He also criticized France’s then-President Nicolas Sarkozy for being too eager to take credit for the intervention to overthrow Muammar Gaddafi. There was just one problem with that plan, according to the US president. “From the perspective of a lot of the folks in the foreign-policy establishment, well, that was terrible. If we’re going to do something, obviously we’ve got to be up front, and nobody else is sharing in the spotlight,” he said, noting that Sarkozy was voted out of office less than a year after the fall of Gaddafi. “It is a huge mess there, bloodshed, a failed state, militia controlling most of the country. Also now, Islamic State has more than 7,000 fighters in Libya,” he said. The West “deposed Gaddafi, and they left. And after that, who took over? The militia. Armed militia…the whole region, North Africa, is destabilized because of the British and American and French intervention. How can we solve it? It may be too late now. Libya is dismantled completely, Libya is a tribal country now, a militia country, so it’s not a state anymore,” Atwan concluded. 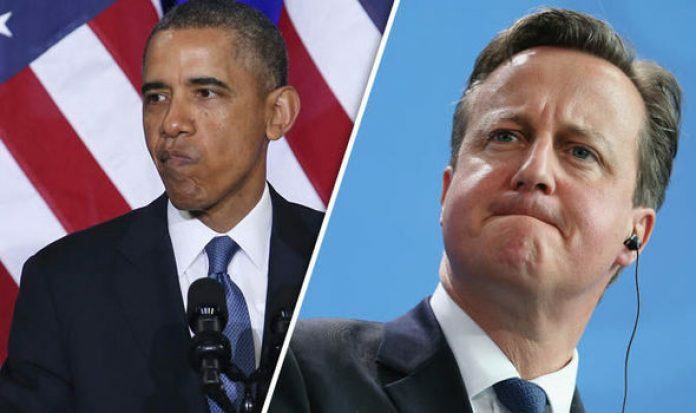 Obama recently stood up to ‘free rider’ Cameron, warning that the UK would no longer be able to maintain its so-called “special relationship” with the US if it did not commit to spending at least 2 percent of its GDP on defense. “You have to pay your fair share,” the US president told his British counterpart at the G7 summit in June 2015. Cameron subsequently met the 2 percent threshold. Libya has been consumed by violence since the 2011 NATO-led campaign to topple Gaddafi, with rival governments and armed groups fighting for control of the oil-rich North African country. It has become a key operating base for Islamic State (IS, formerly ISIS/ISIL). A UN report published Thursday said that IS had “significantly expanded” the amount of territory it controls in the country. Meanwhile, there have been reports that the UK is mulling the possibility of stepping up its involvement in the country amid fears that its campaign against IS in Syria and Iraq needs to be widened to include Libya. Responding to Obama’s comments to the Atlantic, a British government spokesperson said: “I think we would share the President of the United States’ assessment that there are real challenges in Libya, that’s why we are continuing to work hard with our international partners to support a process in Libya that puts in place a government that can bring stability to that country and why we are talking about how we can support such a government in the future,” as cited by the British media.